Crystal skies is a 1.8 survival server with a crystal theme around the server. We pride ourselves on being a fun and creative server that makes sure all ours players are treated fairly and have a good time. We have many staff to ensure this experience and will often accept trial-mods to add people to our staff family. Let's start by talking about our owner, Matt (MattWildness). Matt is a very fun yet focused leader. Matt ensures that everyone is equal and has a great time, even if he himself is feeling down and loves to use command blocks and armorstands. Next, we have our two Co-Owners, Paige (donutnut1) and Ed (EdsChannel). Ed keeps the server running, always making sure that it is lag free and will work endlessly to ensure this if needed and he always will solve issues with server, even if they are minor. Paige is also a very enjoyable, fun person - much like Matt. Paige helps everyone no matter how hard the task at hand is and does all the art for the website. Next we have Gem (Gem), our Head-Admin. she is obsessed with bands, bunnies and flowers. Gem is a great laugh and will often try to entertain you on the server. Our admin is Kai (Kai), he's the person you want to go to if you have a problem and need someone to talk to as he is great at giving advice and loves to help people solve problems. Kai is also the youngest staff member, however can be extremely mature when it comes to helping people. Next up is our Head-Mod Ads (Ads). He is talented at PvP and is good at building modern houses. Ads is a very friendly person and ensures that every single person is having fun and will try to give people something to do if they are bored. Now for our Mods, Will (RoyaIGuard), Shamooki and Bear (bear818). Will is a very intellectual person who always has new information to tell and can help with many of the server problems. Next we have Shamooki, she believes she is a grape and is an amazing builder and always happy to help with any problems. Finally we have Bear, she loves to make sure everyone is following the rules and can often be found in specator mode watching everyone or doing a survival, she too is also always there to answer questions and help where she can. Every month we run a competition on our server, this varies from build competition to redstone, to PvP. We're varying the competitions to allow for every aspect of the game that people may excel at. The competition will always be shown on the scoreboard on the side and also in detail on our website. We currently have a few plugins and other things on the server that we would like to explain a bit about here, however all the information is also in the server. We have a plugin that enables giants to spawn naturally at night, these giants have special abilities such a shooting fireballs and kicking the player. However killing these are worth it, as they drop rare loot such as diamonds. These giants are not only zombies but also slimes and magma cubes too! There are two crystal keys, (A) and (B). Both of these can be dropped by all hostile mobs, however it is a rare chance for this to happen. Once you have collected both halves of the key, you can combine them by typing "/Key Combine". This will then able the key to be used on the crystal portal in spawn which will then give you a large amount of in game money and also a random prize! Skywars is a competitive PvP match where all of the players start on seperate islands and have to fight eachotehr until only one person remains. That person will then be rewarded with in game money. 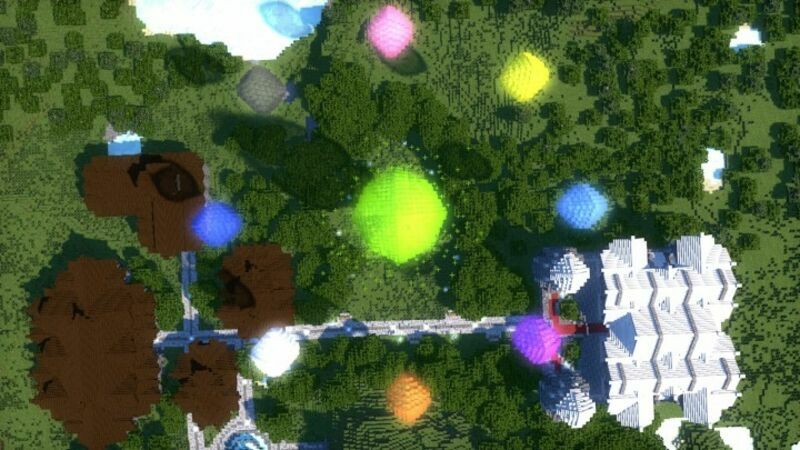 We have themed all of our SkyWars maps around crystals. CrystalPvP is PvP with a twist, where as instead of using potions and boring weapons to attack your enemies, you start with some crystals, which nce right clicked will add an effect to the next person you hit, for example if you use a poison crystal and then hit someone with your sword, then that person will have poison for 5 seconds. All of the classes also come with various abilities too! Tank comes with slowness on all of the armour but deals a lot of damage at close range, however ninja is fast but has less powerful crystals. To join CrystalPvP once on the server type /PvP. We like to reward our players for playing on a daily basis, so this plugin means that you get a random reward for joining every day. This ranges from diamonds to dirt to a special trail. In spawn we have 3 type of crates, these give special items such as trails and custom heads. Interior decorating made easier! Now you can make usable tables, chairs, campfires, tents and more! All of them are craftable and also all usable by our players! We thought that people being able to show their love for one another was important, so we allowed our players to marry each-other. It's completely free, as it costs no in-game money or real life money! Marrying someone comes with special benefits such as being able to set an extra home and also being able to teleport to your partner at any point. We have an auction set up so if a player wishes to sell some good to other players then they can set up an auction and other players can bid against eachother to win the item if they wish. If no-one bids then the item goes back to it's original owner. We have a bank set up in spawn where you can not only store money, but also items and exp too! This is a useful tool for our players as they can store their best items there and all their exp if they are going to fight something or think they may die. As long as three or more players are online, every 10 minutes a message will come up in chat saying "Hover over for the word to unscramble!" or "Hover over for the word to type". For both you can hover over the message and a message will come up, then depending if it's an unscramble one or not, you must figure out what the message says and then type it in chat. The first person to type it will get a small in game money reward. SkyBlock is a survival gametype where you spawn on a small island and have to expand in order to survive. You start with basic supplies such as water, lava and a few other items. Our SkyBlock comes with a shop where you can sell and buy items. You can also select from a range of starting islands, ranging from easy to hard difficulty.